Factory Method design pattern provides unique interface to object instantiation. The decision on which object is to be instantiated is hidden from the outside world in the code. Using this approach different objects can be instantiated dynamically. RETURNING value(ro_result) TYPE REF TO lcl_output. 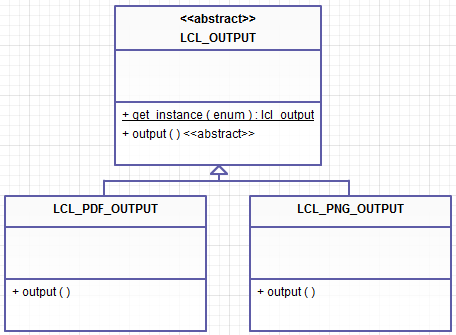 CLASS lcl_pdf_output DEFINITION INHERITING FROM lcl_output. WRITE: / 'Printing PDF document'. CLASS lcl_png_output DEFINITION INHERITING FROM lcl_output. WRITE: / 'Generating PNG Image'. CREATE OBJECT ro_result TYPE lcl_pdf_output. CREATE OBJECT ro_result TYPE lcl_png_output. lo_output TYPE REF TO lcl_output. lo_output = lcl_output=>get_instance( 'PDF' ). lo_output = lcl_output=>get_instance( 'PNG' ). 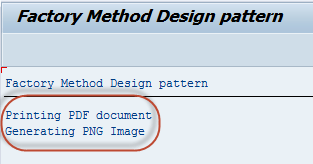 This entry was posted in ABAP, Algorithms, Creational patterns, Design Patterns, Development and tagged ABAP, design patterns, factory method, OO ABAP by Spider. Bookmark the permalink.